How does face recognition emerge in the newborn brain? To address this question, we used an automated controlled-rearing method with a newborn animal model: the domestic chick (Gallus gallus). This automated method allowed us to examine chicks’ face recognition abilities at the onset of both face experience and object experience. In the first week of life, newly hatched chicks were raised in controlled-rearing chambers that contained no objects other than a single virtual human face. In the second week of life, we used an automated forced-choice testing procedure to examine whether chicks could distinguish that familiar face from a variety of unfamiliar faces. Chicks successfully distinguished the familiar face from most of the unfamiliar faces—for example, chicks were sensitive to changes in the face’s age, gender, and orientation (upright vs. inverted). Thus, chicks can build an accurate representation of the first face they see in their life. These results show that the initial state of face recognition is surprisingly powerful: Newborn visual systems can begin encoding and recognizing faces at the onset of vision. Results from the 10 face-change conditions. 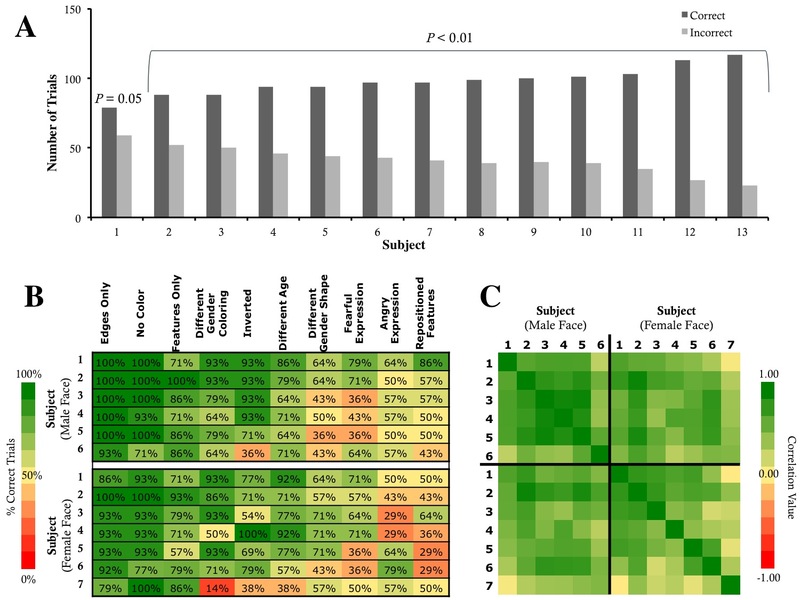 Each bar shows the average percent of correct trials in each condition for the male (blue bars on the left) and female (green bars on the right) imprinted face. Chance performance was 50%. Error bars denote standard error. (A) Performance of each individual subject (ordered by performance). The graph shows the total number of correct and incorrect test trials for each chick across the test phase. P values denote the statistical difference between the number of correct and incorrect test trials (computed through one-tailed binomial tests). (B) The percentage of correct trials for each chick in each condition. Chance performance was 50%. 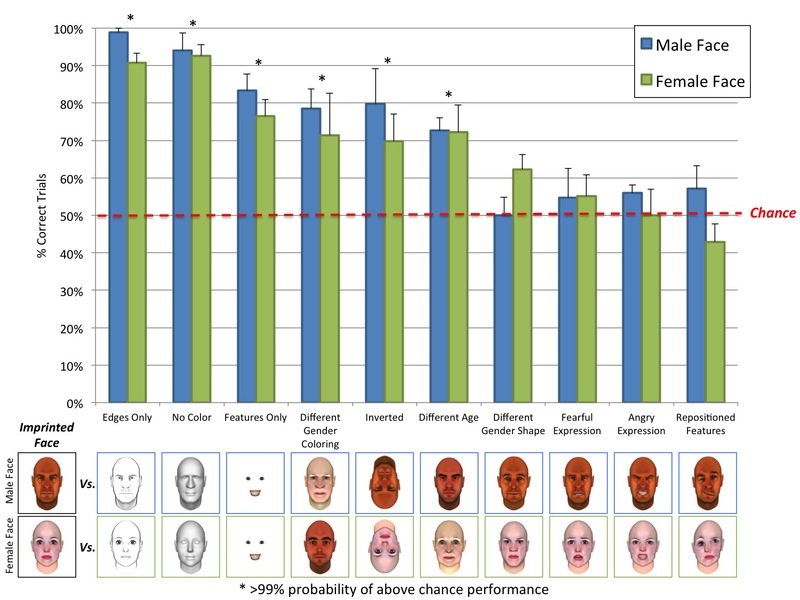 Subjects are ordered by overall performance for each imprinted face. (C) A correlation matrix showing the correlation in face recognition performance for each pair of chicks. Each box shows the correlation between two chicks’ percent of successful trials in each condition. The subjects are ordered by overall performance for each imprinted face. The cells are color-coded by correlation value. The color scale reflects the full range of possible correlation values.